We have over 24 years of experience working with school districts in California and Fidelity Safety and Training LLC is a member of the California Schools Nutrition Association and National Environmental Health Association. 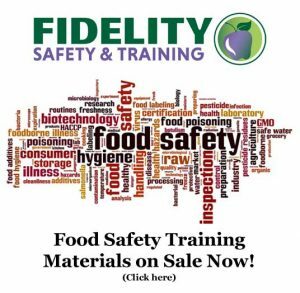 We offer food safety training, HACCP programs, professional standards training, food allergy safety, kitchen safety and training, online training, and warehouse forklift training and certification. Contact us for more information or for a no-obligation quote. Arizona and California law requires each school food facility that prepares or serves unpackaged food to have at least one person certified as a Certified Professional Food Manager also known as ServSafe® or Food Protection Manager. The exam and certificate are ANSI/ASTM Accredited and approved nationally. Certification is good for five (5) years in California. You may send your employees to one of our regular course locations (Bakersfield, Bishop, Mammoth Lakes, Mariposa, Prescott, San Luis Obispo, Santa Barbara, Santa Maria, or Visalia) or attend a course at one of our host district locations or host a course at your district. There are discounts for groups and for hosting a class for neighboring districts. Our class is typically 3.5 to 4.0 hours in length and then allow up to two hours for the certification exam. This program is 5.0 hours of USDA Professional Standard hours. Online and instructor-lead training is available and there are three training options for schools and universities. AllerTrain K12 is a food allergy and gluten-free training course designed for managers in the primary and secondary school settings. 1 in 13 children of school age have a food allergy and it is vital that schools understand how to keep children with special dietary requests safe. Because it is designed with the child in mind, AllerTrain K12 helps schools better serve children with food allergies, celiac disease and food intolerances, by teaching staff how to recognize symptoms of an allergic reaction, and how to have a cafeteria set-up that will help prevent these reactions from occurring. Kitchen policy recommendations, current food allergy legislation and the emotional impact of food allergies on kids are also included. AllerTrain U is an ANSI accredited, manager level, food allergy and gluten-free training course designed for those who serve food in a college or university setting. Students who suffer from food allergies or celiac disease can have a hard time transitioning to life on campus, especially when they have special dietary needs. This course will prepare dining staff to cater to these students’ needs, teach them how to recognize symptoms of an allergic reaction, and how to implement proper procedures in their dining hall that will help prevent these reactions from occurring. Recommendations for policy implementation as well as information on current food allergy legislation is also covered. AllerTrain Lite is the nation’s leading ANSI accredited food allergy and gluten-free training course designed for all food handlers. The Lite version is a condensed version of the AllerTrain manager level course. AllerTrain Lite teaches employees how to safely interact with and serve diners with special dietary needs. Dietary needs covered are food allergies, intolerances and Celiac disease. Upon completion of the training, learners will understand allergen control in the front of the house, back of the house and in emergencies. Please contact us if you have any questions or would like to schedule a course. This rule implements a legislative provision which requires school food authorities participating in the National School Lunch Program (NSLP) or the School Breakfast Program (SBP) to develop a school food safety program for the preparation and service of school meals served to children. The school food safety program must be based on the hazard analysis and critical control point (HACCP) system established by the Secretary of Agriculture. The food safety program will enable schools to take systematic action to prevent or minimize the risk of foodborne illness among children participating in the NSLP and SBP. If you are looking for a HACCP program or need the required training, please contact us for more information. This program is available online in English or Spanish for $9.95 each. We can also come out to your district and conduct an instructor-led training program. This program is 3.0 hours of USDA Professional Standard hours. Professional Standards for school nutrition professionals is a key provision of the Healthy, Hunger-Free Kids Act of 2010 (HHFKA). The final rule, published March 2, 2015, requires a minimum amount of annual training hours for all state directors of school nutrition programs, state director of distributing agencies, school nutrition program directors, managers, and staff. Required training topic areas will vary according to position and job requirements. More information including a full list of training topics are coming soon. Please contact us in the meantime if you have questions. The California Occupational Safety and Health Administration (Cal/OSHA) has issued training requirements for forklift operators and drivers of other industrial trucks. The new rule spells out detailed training requirements for operators of “powered industrial trucks,” which is defined as “mobile, power-driven vehicles used to carry, push, pull, lift, stack, or tier material.” These would include equipment such as high lift trucks, pallet trucks, and forklift trucks. Our certified forklift training program helps workers reduce the risk of injury or death caused by forklift accidents. This training program is designed to ensure compliance with the Cal/OSHA forklift regulations. Operators are also required to be evaluated every three years. The evaluation consists of observing the forklift operator during normal operations to determine if the operator is performing safely, and second, ask pertinent questions or provide a written exam to ensure that the operator has the knowledge or experience needed to operate a truck safely. In some cases, because of the danger or complexity of the operation, the extent of the change in conditions, or the operator’s need for additional skills, the evaluation will need to be lengthier and more detailed. We offer group training (not individual training) and certification at your place of employment on your lifts statewide. Contact us today for more information on group training or for a no-obligation quote.